Create an area free of distractions that is the same every day. Try to make the designated homework area somewhere you are available if they need help; this is important for pre-teens. The end of the kitchen table, with no tech, is a great place to do this. It is really important to give your child a good quality snack and a drink so they have some energy to do their work after school. The Change4Life campaign is currently advising parents ‘to give their children a maximum of two snacks a day containing no more than 100 calories each, not including fruit and vegetables’. Re-fueling also allows some switch off time between school and homework which will help them work more effectively. It is important to establish a set time for your child to do their homework. This creates a habit, meaning they are more likely to actually do it (without too much arguing). Another important part of their routine should involve looking at how they approach a piece of work. When your child first starts to get homework go through it with them, work out what they need to do and think about how much time they should spend on each task. This will soon become second nature and eventually they will be able to work this out by themselves. These skills will aid them hugely in independent learning when they get to secondary school and will help them balance a heavier workload. We’ve all been there, the dreaded subject, the one we have forgotten or never understood in the first place. Even worse, you thought you knew it but the teaching method has changed. You can’t make head or tail of it. But don’t panic. You are not the teacher. You don’t have to understand the work your child is doing your job is to support them. They should have covered the subject matter in class and homework is there to reinforce their learning. The best thing for you to do is to show genuine interest in what they are doing. A handy trick is to have them explain the work to you. This will help cement the topic in their brains, allowing you to get your head around it, whilst encouraging them to see learning as interesting rather than a dull laborious task. 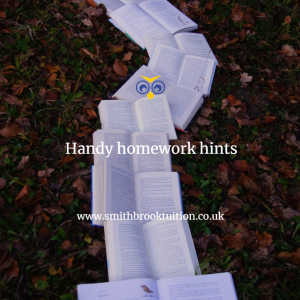 Let us know your favourite homework tips on social via via Facebook and Instagram.